The pull-through braid isn't actually a braid, and doesn't require using the pull-through technique -- but the result is a gorgeous style that is easy to create and can be dressed up or down for any occasion. 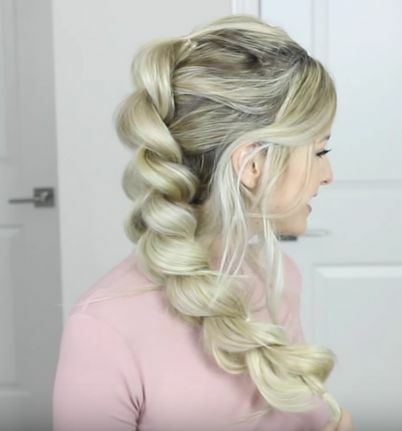 The Luxy Hair video below demonstrates one technique for creating this amazing "braid." 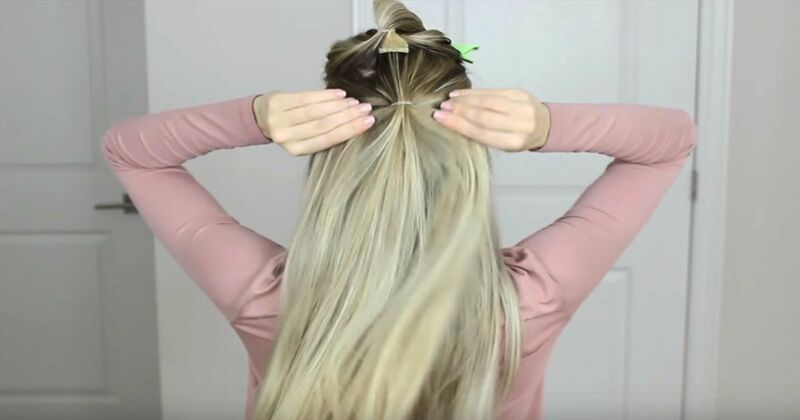 The model in the video uses Luxy's clip-in hair extensions for an incredibly full look, but you can simply skip the clip-in steps if you do not have extensions. 1. To execute this look, you will need several hair elastics and a large clip. You may also want a rat-tailed comb for parting ponytails, and, of course, the hair extensions if you are using them. 2. Create the first ponytail at the crown of your head, using hair from above your temples. You can leave some hair at the front for a soft face-framing look, or pull all of the hair back for a sleek effect. Secure with an elastic band -- if using extensions, clip the extension to the underside of the ponytail before securing. 3. Flip the ponytail forward over your face and hold with the clip. 4. Create the next ponytail by gathering hair from just below the temples -- add extensions if using them. Secure with an elastic band a couple of inches below where the first elastic band will fall. 5. Unclip the first ponytail and flip it backward to the back of your head. Keeping your hand on the ponytail, divide it into two even left-right halves. Move each half out of the way -- just drape the left half over your left shoulder and the right half over the right shoulder. 6. Flip the second ponytail forward over your face and hold with the clip. 7. Create a third ponytail by gathering hair from a little lower; about the middle of your ears. Include the two halves of the first ponytail. Add the extension if using it, and secure with an elastic. You've just created the first "braid!" 8. Repeat steps 5-7 until there are a few inches of hair left at the bottom of the braid. If your hair is long enough, you will be able to pull the hair forward to finish the braid in front to better see what you are doing. 9. After completing the braid, finish the full look by using your thumb and forefinger to gently pull apart each pull-through section. Go slowly and do a little at a time to get exactly the look you want. Secure the bottom with a final elastic. 10. If you have left hair loose toward the front, use a curling iron to create a soft look. An alternative method for creating this style actually uses a "pull-through" technique. Start with all of the hair in one ponytail, secured at the crown. Separate it into top-bottom halves (instead of left-right) and secure the top half with an elastic a couple of inches lower than the first one. Pull the bottom half through the top half (above the elastic) and secure with another band. Repeat process until you reach the bottom of the hair. Plump each section as in step #9 above.